Pictured above: My original watercolor wave painting in back – zipper bag, notebook, and vinyl sticker prints. I love doing watercolor paintings, and sell originals in my shop. But! I also wanted to offer prints. And not simply prints to hang on a wall. Fun stuff. I am a big fan of ‘functional art’ — art that you can use on a daily basis. So, after weeks of work setting it up and ordering samples to check print color and quality, they are finally here and ready to go! I have been busy painting, scanning, and getting my artwork ready for printing. I have more to do and many ideas to explore. For now, here is a peek at the products I have ordered to check out. 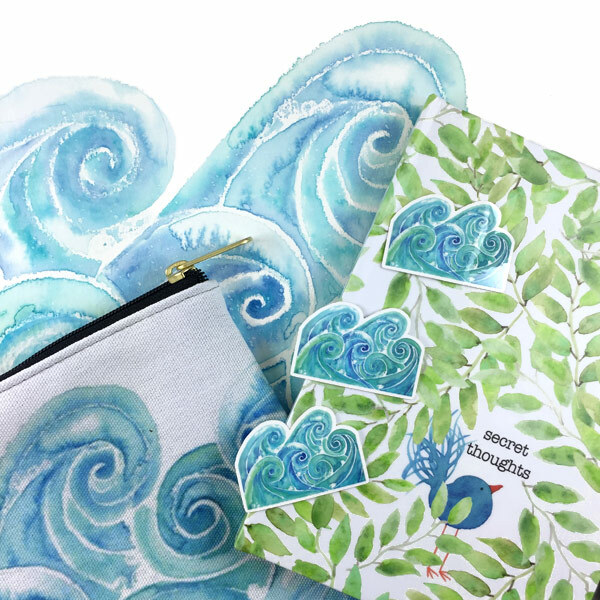 Watercolor Waves Accessory Pouch – 2 sizes, choose black zipper or white zipper. Made and printed in the USA with a heavy duty fabric and zipper. Secret Thoughts Journal – 128 pages, 90gsm paper, choose ruled line or blank pages. Printed in USA. Watercolor Waves Vinyl Sticker – vibrant, glossy vinyl that is tough and fade-resistant. Wave cutout. I am quite happy with the quality of the items and the print color and quality. I will continue designing and checking out samples. I have the stickers on hand for shipping directly. The other products are printed and shipped directly from the printer. Shipping varies for each product. Shipping discounts for multiple items. Details in each listing. I have watercolor birds and waves and leaves so far, in addition to my watercolor originals. Something You Would Like to See? Looking for a specific type of product or watercolor subject? I welcome your input. Please drop me a note and let me know.